With an impressive pedigree, Power of Illusion mostly lives up to its inspirations. Every now and then, I go into a review giddy and expecting the world, especially after having closely followed a game. Epic Mickey: Power of Illusion is one of those games, coming from the developer of Monster Tale and Henry Hatsworth and based off the classic Genesis game Castle of Illusion. The game’s three worlds and myriad secrets didn’t disappoint me, but at the same time, didn’t surpass my expectations. Plain and simple, some things worked, and others didn’t. At its best, Power of Illusion is a fun, happy-go-lucky, old-school platformer. It has a slow pace, reminiscent of its spiritual predecessor Castle of Illusion and more recent leisurely moving 2D platformers such as Mutant Mudds. If you’re looking for something with the speed and pace of a Mario game, look elsewhere. 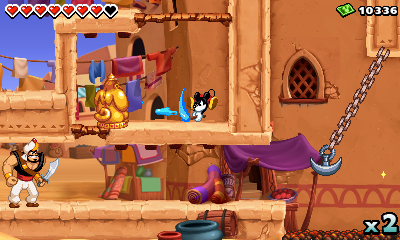 Power of Illusion’s levels are long and dense, with a lot of areas tucked away, only reachable through special abilities or superior platforming. The jumping and other basic attacks are more or less ripped from Castle of Illusion; Mickey moves slowly but deliberately. Power of Illusion is not a speedrun game. It’s focused on exploration, discovery, and whimsy. Fortunately, it hits those notes often, and well. The big hook tying the game to the Epic Mickey series is the paint and thinner mechanics. At any time, you can create and erase certain objects using the touch screen. Drawing amounts to tracing over objects, which is fun, but the repetition can become grating in certain areas. Seeing objects come to life is enjoyable, and it’s rewarding to perfect recurring prompts. The whole mechanic never really comes together, though: it feels more perfunctory than anything else. Thinning, however, falls extremely flat. Erasing objects requires players to meticulously wash away the object on the touch screen, which ends up feeling like an old DS mini-game gone wrong. It lacks the accomplishment of painting, and doesn’t evolve or improve over the course of the game. I reached a point where I actively avoided dealing with erasing objects. Outside of a few levels, most of the in-game paint and thinning is superfluous, amounting to more of a bonus inclusion than anything crucial to the gameplay. The few boss battles, on the other hand, make great use of the paint/thinner mechanics, making them engaging fights that show signs of where the concept could go. The game’s 11 levels, spread across three worlds, go by far too quickly, though players are encouraged to go back and search for treasure chests and other characters by the inclusion of the Fortress system. 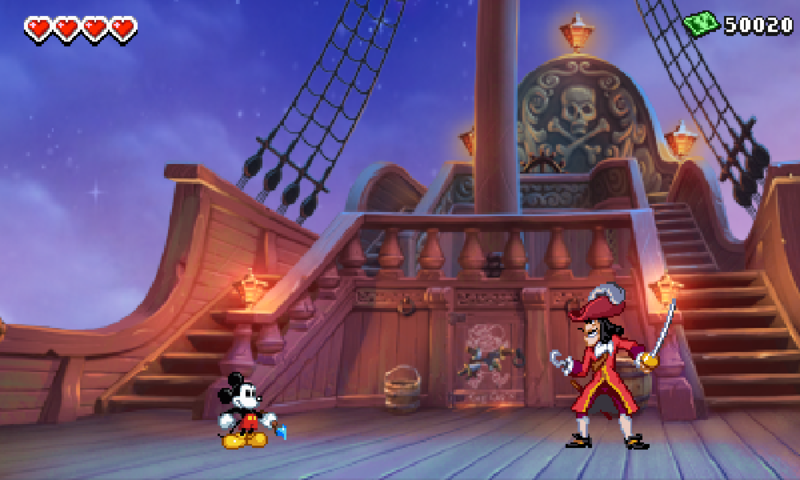 Throughout every level, Mickey runs into other Disney characters that he rescues and then sends back to individual rooms inside of the Castle of Illusion. From there, you can visit each character and upgrade their rooms by completing quests, which include drawing something specific for the character and returning to levels to scour for specific objects. Luckily, every level has two distinct enemy layouts, making the retreading more tolerable and enjoyable. Outside of the Disney fan-fueled desire to see Scrooge McDuck’s lovely sprite sit in a familiar locale, though, the rewards for these quests are mostly boosts to Mickey’s health, attack, and painting ability. Adding to and upgrading the Fortress can get addictive, but it’s hard to keep track of the quests you have active at any one time. A centralized list is absent, and the only way to know what to do with something is to search for icons that signify a quest continues with this character or level. Power of Illusion is a game for Disney fans, specifically those with fond memories of playing the Disney games made by Capcom and Sega on Super Nintendo and Genesis. It has ample amounts of fan service and finely tuned platforming, but some of its periphery elements, such as the paint and thinner mechanics, just fall short. In a way, the game is oddly similar to the first Epic Mickey on Wii: a rock-solid concept hampered by a few stifled gameplay ideas. In a way, the game is oddly similar to the first Epic Mickey on Wii: a rock-solid concept hampered by a few stifled gameplay ideas. That is similar to the original Epic Mickey, but it's also similar to DreamRift's previous work. As much as I love Henry Hatsworth, it certainly has parts that take away from its great ideas. The game almost sounds too short to warrant a $40 price tag, so I'll probably try to pounce on one of those black friday deals. Thank you Neal for the timely and well written review. Was there no one free to do the review that wasn't wined and dined at Disney World (or Disney Land and Club 33 just to cover the bases)?